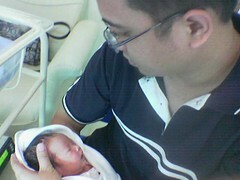 Damia Anura Azlan was born on November 9 at 5:35 pm. Weigh at 2.6 kg at An Nur Specialist Bangi. There is no words that can describe how I feel right now. "everybody can be a father, but not everyone can be a dad"
9 Responses to "I am a proud father now"
oo ok thanks kak wan..
kak wan bila plak due? 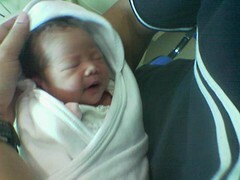 alhamdulillah and congrats for your new bundle of joy. kirim salam ngan mak dia. I know i'm abit late but CONGRATULATIONS on your new born baby! Wishing you and your baby the best of health! !